Here in Minnesota, winter weather usually hits a little too soon and lasts a little too long. Now is the time to get ahead of the game and get your home ready before this year’s Polar Vortex. Sometimes the hardest part is knowing where to start. Home Energy Squad Enhanced is a great resource. At a Home Energy Squad Enhanced visit, two energy professionals assess your home to help you improve comfort, save energy and give you peace of mind. The City of Minneapolis is now offering free Home Energy Squad visits to income qualified Minneapolis households, and no interest financing for insulation and air-sealing upgrades for a limited time. 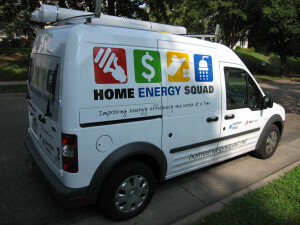 Home Energy Squad visits are available for $70 to Minneapolis households over the income limit. The visit includes a blower door test with an infrared camera inspection to identify air leaks and insulation voids, a safety check of your home’s heating system and water heater, and the installation of energy saving materials. Materials may include door weather stripping, a programmable thermostat, CFLs, faucet aerators, shower heads, and a water heater blanket. At the end of the visit you will receive a customized report with prioritized recommendations for energy upgrades, rebate information and financing options to help you take the next steps. If insulation or air sealing is recommended, you will also receive a quote for the work to be done. Call 612-335-5874 or visit us online to check your eligibility or schedule Home Energy Squad your visit today!